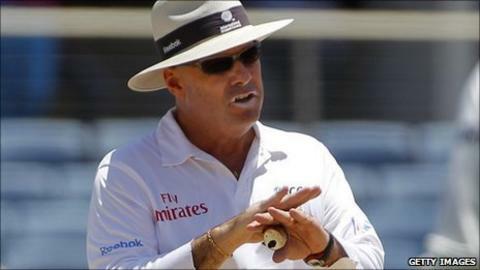 Recently retired Australian umpire Daryl Harper has accused India of "bullying", just days before the start of their Test series against England. Harper pulled out of his farewell Test this month after criticism from India players and a "lack of support" from the International Cricket Council. "I thought someone had to make a stand, so I did," said Harper. India said they had "no comment to offer" in reply to Harper's claims but he has been backed by the ICC. "I never tolerated bullying when I was a teacher," Harper said, "and I don't think bullying should be allowed to continue here." ICC chief executive Haroon Lorgat told BBC Sport: "We've supported Daryl over many years. "He has been a very good umpire and his statistics speak for themselves. "It is unfortunate it has ended in the way it has in the West Indies but we support Daryl and it is fitting that he was on the elite panel." Following the first Test between India and West Indies in June, which India won by 63 runs, captain Mahendra Dhoni condemned Harper's performance. Dhoni said: "If the correct decisions were made the game would have finished much earlier and I would have been in the hotel by now." His comments went unpunished by the match referee Jeff Crowe. Indian newspapers also reported that "a very senior member of the side" had claimed that the entire team did not want Harper to officiate in the final Test. "We don't want him - you can quote it as the reaction of the entire Indian team," was the alleged remark. Harper had been due to officiate in the third Test a few days later but pulled out. The 59-year-old Harper said: "There were a number of factors... but the main one was what I deemed was a lack of support from the ICC. "I wanted some action to be taken when there was some unwarranted criticism of me. But no action was taken after the Test match and I felt that if the ICC were not going to take some action then I thought I would. So I packed up and went home. "There were five or six articles that were very derogatory that were not good for me and not good for cricket." Harper also feels that the behaviour of India's players is not in the spirit of the game. "Cricket umpires have to have thick skin these days," he said. "I don't think I'm easily intimidated but you must respect the officials and I don't think that was the case. It's just the Indian way at the moment. "It doesn't matter if it is Zimbabwe, New Zealand, Australia, England or India. The same conditions should apply and when I look back at before that third Test match I was starting to think 'maybe I should wait and see who is playing' then I thought 'this is a bad day, this is not a game I want to be involved with at the moment'. The four-Test series between India, the number one side in the world, and England begins on Thursday at Lord's.